In the late nineteenth century Fredericksburg was an isolated community. It was 75 miles of bad roads, steep hills, and low water crossings to Austin or San Antonio. It took a week or more for a freight wagon to make a run to San Antonio and back. What this town needed was a railroad. In the 1880s a group of local businessmen, led by Bank of Fredericksburg president Temple D. Smith, began a campaign to build a railroad from a junction near Comfort to Fredericksburg - a distance of 24 miles. Other men on the railroad committee included Charles Nimitz, August Cameron, Oscar Krauskopf, L. F. Kneese, and Adolph Lucas. A. W. Moursund of Blanco County served as legal counsel. Because railroads were not cheap, the committee needed investors with deep pockets. A group of Chicago businessmen, including General Grant's son Frederick, was briefly interested in the project, but it never got off the ground. For 25 years the committee considered at least 30 deals from 20 different promoters, but the problem was always the same. Engineers believed the hills were too high to ever get the railroad to Fredericksburg. Then in 1911 Temple Smith met a former shoe salesman from Kansas City named R. A. Love. Mr. Love dreamed big and talked fast, but he knew how to get things done. He made people believe he could move mountains. He organized a group of San Antonio investors and made his pitch to the railroad committee. In a few days the deal was struck. Months of hard work lay ahead. The main barrier was the "big hill" just inside the Gillespie County line. The hill was a high limestone ridge that separated the Pedernales Valley from the Guadalupe River watershed. And there was no way around it or over it. The railroad had to go through it. For four months workers chipped and blasted away at both ends of the big hill, and by the end of October the 903 foot tunnel was finished. Then on a late October day in 1913 a small crowd gathered near the tracks in Fredericksburg. For more than an hour adults scanned the hills in the direction of Cain City. Children put their ears to the rails. Then they heard it - a high lonesome steam whistle accompanied by a cloud of black smoke on the horizon. Several minutes later the first locomotive rolled into Fredericksburg, covered in grease and soot and spewing vapor like a leaky steam pipe. The men have their railroad tickets in their hat bands. That glorious event touched off a massive 3 day celebration called the Eisenbahnfest (in English the Great Railroad Jubilee). Temple Smith drove the symbolic last spike. Governor Oscar Colquitt made a speech. There was music, food, beer, and a parade, although rain washed out the free barbeque dinner scheduled for the first day. After the celebration the Fredericksburg and Northern Railroad got down to business. 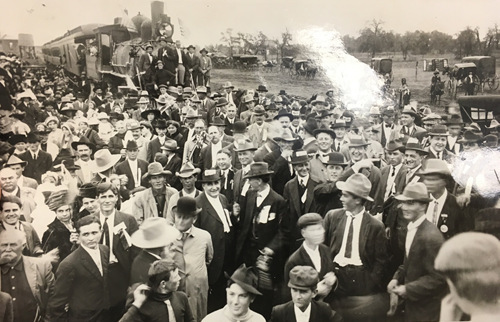 Six days a week the train left Fredericksburg at 7:15am with stops at Cain City, Bankersmith (a new town named after banker Smith), and Mount Alamo before arriving at the junction near Comfort at 9:15am where passengers connected with the San Antonio and Aransas Pass train. That train arrived at the San Antonio station at 11:54am. The return train left San Antonio at 2pm and arrived in Fredericksburg at 7:50pm. Sunday had a different schedule. But train schedules were exercises in wishful thinking. Delays were common. Rockslides had to be cleared, and herds of cattle and goats had to be removed from the track. Railroad employees sometimes had to chop wood along the way to replenish the coal supply. Soft roadbed caused ties to sink resulting in derailments. Lacking funds for heavy equipment, passengers and area residents helped right derailed cars. A 2 hour trip could take all day. The delays were a nuisance, but a changing economy caused real problems for the new railroad. Highways were improving. Gasoline was cheap. Automobiles gave people a freedom to travel in ways the railroad never could. Trucks were competing successfully with trains for hauling freight. From the beginning cash flow problems hounded the railroad, and within a year the company was in receivership. New investors took over the company and ran it at a loss until 1942 when it was abandoned and sold for scrap. 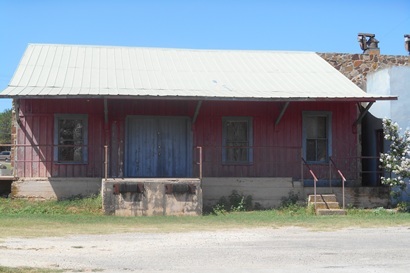 What remains of the old depot in Fredericksburg. 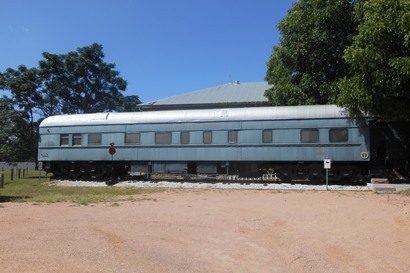 An old railroad car on a short section of track in Fredericksburg. Now a B & B.